Student speakers Avery McLaren, Sienna New, Skarlett Medrano and Dania Gabriela Chavez Tena cut the ribbon at the ceremony celebrating the new solar panels at the Riverview School on Tuesday morning. 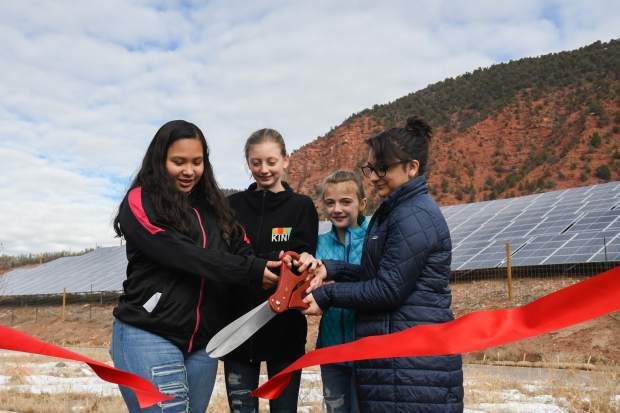 Students, administrators and local energy leaders celebrated the solar array that will give Riverview School, the Roaring Fork School District’s newest school building, a complete electrical offset and save it money down the road. Riverview students Skarlett Medrano, Dania Gabriela Chavez-Tena, Sienna New and Avery McLaren spoke about the importance of solar energy to the school before cutting the ceremonial ribbon Tuesday. “Solar panels are so easy. Once the panels are installed, you can start saving not only money, but Mother Nature, by just leaving them out in the sun,” New said at the event. The energy generated from the panels — which at full capacity generate 340 kilowatts — will be metered at the school. Whatever Riverview doesn’t use, particularly when the school is out of session during the summer, will go to the Xcel Energy grid. Xcel will reimburse the school nearly 5 cents per kilowatt-hour that goes to the broader network, as part of a 20-year contract with the school. 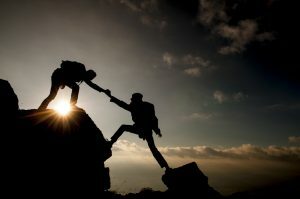 “The Roaring Fork School District is making a statement. 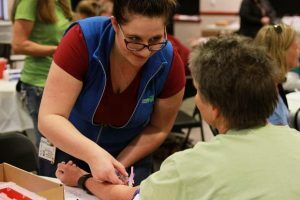 They have two schools now that are net-zero for electricity with solar power,” said Shelley Kaup, Glenwood Springs city councilor and energy efficiency consultant for the nonprofit Clean Energy Economy for the Region. Roaring Fork High School in Carbondale is also 100 percent solar-powered. “I think they’re setting a great example for the community,” Kaup said. Kaup helped the school district apply for a $100,000 Randy Udall Energy Pioneer Grant from the Community Office for Resource Efficiency (CORE). The district also received a $150,000 grant from the Garfield County Federal Mineral Lease District for the Riverview project. The solar array will save the district about $18,000 a year on energy costs and, through the Xcel contract, will generate revenue around $23,000 annually, Shannon Pelland, RFSD chief financial officer, said. The district’s $350,000 investment after the grants will be paid back in nine or 10 years, Pelland said. But the two grants and acceptance into the Xcel Rewards program “made that solar array possible,” Pelland said. “When I look at these panels, on one level it’s panels powering the school. But another component of that is saving the taxpayers money,” RFSD board of education member Matthew Hamilton said during the ceremony. Solar is one of the most efficient and inexpensive ways of reaching CORE’s ultimate goal of a carbon-neutral region, Marty Treadway, program director at CORE, said in an interview. But, along with solar and other renewable energy sources, consumers also must use electricity more efficiently to achieve zero emissions, something Riverview has made a commitment to do. “This would not be nearly enough solar for a school 10 years ago,” Treadway said. 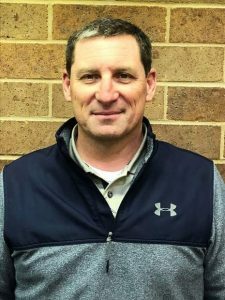 “As part of the overall school design, a lot of effort went into making sure the heating and cooling systems were efficient,” Riverview Principal Adam Volek said in an interview. 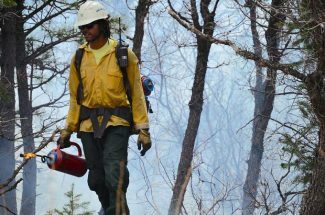 “I think it’s important that as we talk to kids about how they should be stewards of their environment and take care of things that we’re actually doing it, not just saying it,” Volek said. Timed heaters may not be ideal for after-hours winter meetings, like when the school board held its evening meeting at Riverview on a stormy evening last week. But, from the automatic lights to efficient water use and composting, Riverview has built sustainability into its daily operations. “It’s great to see the school district take such a leadership role in terms of implementing solar energy projects in their schools,” Katherine Rushton, commercial sales manager with Sunsense, which consulted with the district on the project development then won the contract to design the array. In addition to the solar arrays at Riverview and Roaring Fork High School, the district has constructed solar arrays at the affordable housing developments. 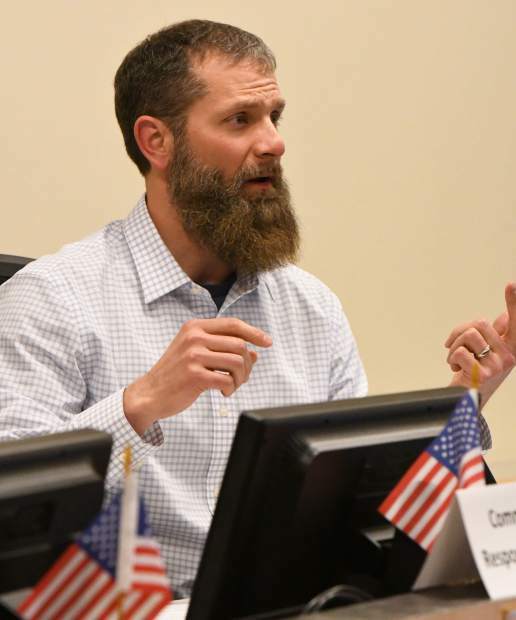 “If it makes economic sense to a school district, it just goes to show that solar is viable for all the big energy users in our area,” Rushton said.